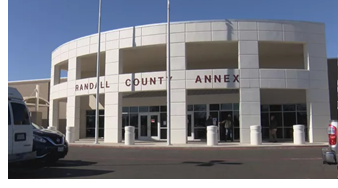 ​​​ AMARILLO – After almost five years of planning and construction, the new Randall County Annex is operating. The original 10,000-sf annex on Georgia St. was built in 1974. The new facility is over four times that size at 4320 S. Western St. near 45th. Total square footage of the entire building is 62,000 sf but Randall County is using 40,800 sf. The additional 21,000 sf will be used in the future. Amenities inside the new facility include a new voting center, a second county court at law, a new tax office, a 17,000 piece tile floor, and the county seal on the floor.